American poker player Bryn Kenney won €1,784,500 in the €100,000 Super High Roller at the PokerStars Championship presented by Monte-Carlo Casino® beating a field of 61 players. The total prize pool was an impressive €5,948,415. Other final table finishers included Ole Schemion, Daniel Dvoress and Sam Greenwood. Peruvian poker player ‘SPEWTARD’ collected $155,588.58 becoming the latest PokerStars Sunday Million champion after beating a field of 889 players. The total prize pool was $1,078,400. 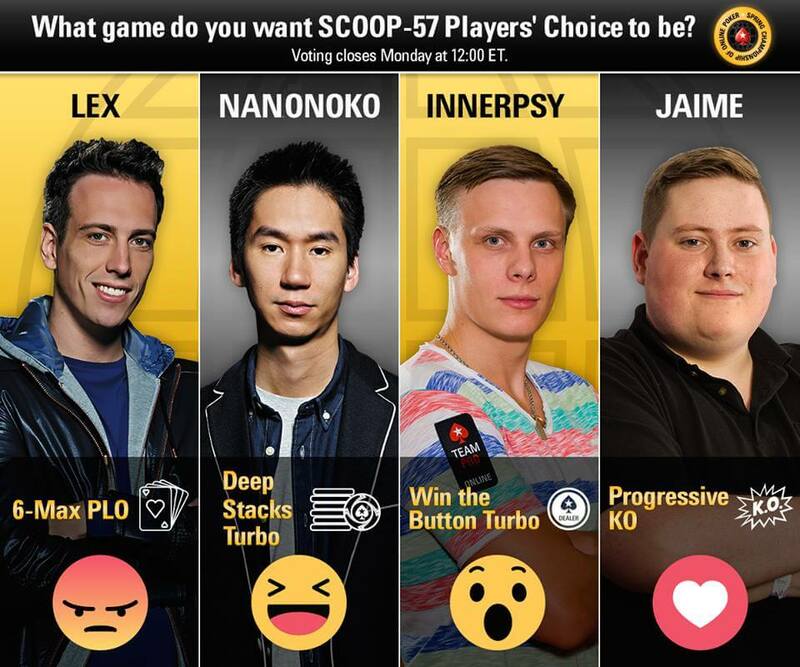 More than 3,350 players have already voted on the PokerStars Facebook page for the format they would like to see as the Players’ Choice Event for the Spring Championship of Online Poker (SCOOP) 2017. Players have until May 8 at 12:00ET to vote for their favourite from 6-Max Pot Limit Omaha, Deep Stacks Turbo, Win the Button Turbo and Progressive KO. The event that secures the most votes will then take place on May 22 14:00ET as the last SCOOP event of 2017. Team PokerStars Online Kevin Martin is still going strong in the Big Brother Canada house but there’s a Triple Eviction Night coming up tonight! To show their support for Kevin, players should log into the PokerStars client Thursday, May 4 at 20:00 ET and take part in a special tournament, “Kevin Martin’s Special KO tourney for Triple Eviction Night”, and a $1.10 Progressive KnockOut with $1,000 added to the prize pool. Look for Tournament ID 1902230039 on the PokerStars client. Number of days until PokerStars Championship Sochi takes place. From May 20-31, players can expect an excellent event in an exciting location, a range of tournaments and formats tailored to suit players of all levels and a schedule featuring must-play events such as the RUB 66,000 (approx. $1,160) PokerStars National Championship and the RUB 150,000,000 guaranteed PokerStars Championship Main Event. As detailed above, poker players have the chance to decide on the format they would like to feature at this year’s Spring Championship of Online Poker (SCOOP) as championed by members of Team PokerStars Online. Jaime Staples, Mikhail Shalamov, Randy Lew and Lex Veldhuis have each put forward a format that they want to be voted in. Players can have their say by casting a vote on the PokerStars Facebook page. Hollywood and stand up superstar Kevin Hart announced his partnership with PokerStars with a clear aim to bring the fun back to poker.